"Ping" is Taiwanese measurement unit for area. and the equipment in the photos (was sold in 2006). 2 The overall plant structures are devided into 3 sections by colors. Total Area in YELLOW: 10,944m2 Suitable for extra-heavy industry, such as steel mill. 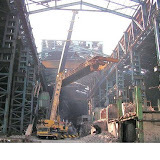 Plant & Steel Structure Plant.